For a long time doctors thought SIDS could be avoided if parents adhered to safe sleeping guidelines for babies—but a new finding says it might not be that simple. The terms SIDS relates to any unexplained death in an infant, but the syndrome is most commonly associated with deaths that result from unsafe sleep practices—at least that's how doctors had always seen it. But a new study has found that sleep environment is just one of several factors at work with this devastating issue. 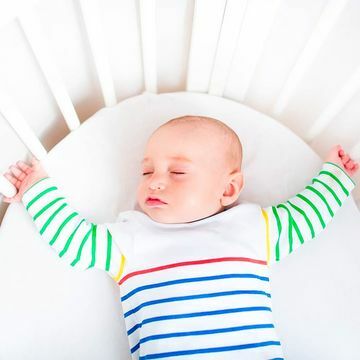 Researchers from Boston Children's Hospital and Dana-Farber Cancer Institute analyzed 30 years of data to come to a conclusion that might surprise a lot of new parents: When it comes to preventing SIDS, we need to consider more than simply how the baby sleeps. The study didn't just look at infant mortality rates associated with SIDS—the researchers also looked at those linked to known causes and suggested that the lines sometimes blur between death classifications. They even mentioned that diagnostic practices should improve, as some unexplained deaths were chalked up to SIDS but in reality were due to known causes. So what efforts can parents take to keep their baby safe? "It is true without any qualification that it is safest for babies to sleep on their backs. This study and others have shown it," Richard Goldstein, M.D., pediatrician in the Pediatric Advanced Care Team at Boston Children's and Dana-Farber and the study's lead researcher, said in an abstract for the study. "This study raises the question of other factors being critical in declining SIDS rates, not just sleep environment. Efforts to understand the biologic vulnerabilities of these infants are important." His top three recommendations for keeping an infant safe? "Place the infant in a supine position; do not smoke or drink during pregnancy or while caring for a dependent infant; and breastfeed," Dr. Goldstein told Fit Pregnancy. He also went to on discuss the importance of understanding the other factors that might be at work in instances of SIDS. "We actually don't believe that SIDS is an accident or a mishap most of the time," Dr. Goldstein said. "We think that SIDS is a severe expression of a yet undiagnosed disease or diseases. So long as the information that we have really comes from population-based surveillance, death certificates and death scene investigations, it limits specific information about the intrinsic nature, the specific features of the child." Dr. Goldstein named a few classic intrinsic factors that put infants at greater risk for SIDS: "Being born black or Native American, being born in poverty, alcohol or tobacco exposure during pregnancy—those are kind of reflections, we believe, of some biological underpinning," he said. "We have found that the majority of babies who die from SIDS have altered levels of a serotonin. We've also recently reported that over 40 percent of babies who die from SIDS have a structural lesion in the temporal lobe in the hippocampus—the cells just aren't formed correctly." While Dr. Goldstein and his team do believe there are other risk factors at work, he still believes in the importance of a safe sleep environment, calling sleeping chest down an "extrinsic risk" for infants. "I can't make the risk of a child in unsafe sleep environment go away—especially with [sleeping chest down] or sleeping on couches and the like. I think the message has to be that you safe proximal sleep [or with your baby nearby]." Could this new research open up the door to safer co-sleeping? "It's hard for me to say under these circumstances you get a pass on co-sleeping," Dr. Goldstein says. "There's really no way to know who has the elevated level of risk, at least at this point."